Sometimes I question my own sanity when I reflect on the amount of hours I spend working part time weekly (it verges into full-time territory). But, such is the life of a broke college student. 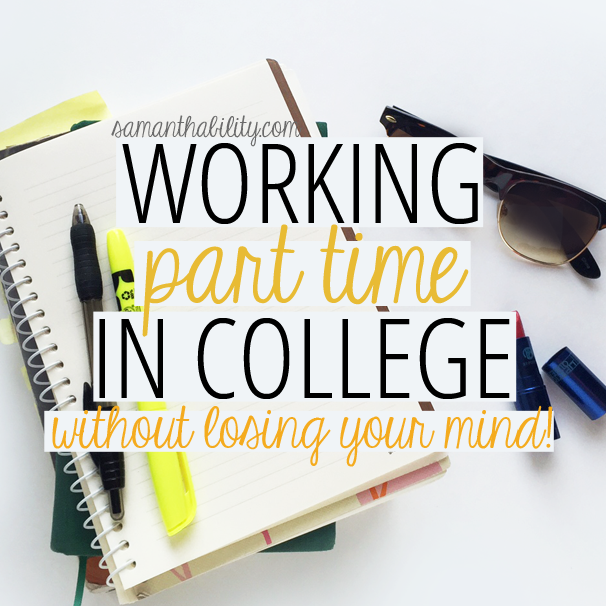 Working part time while in college is a great way to lessen the financial burden of college. Personally, I’ve had to take out a number of loans in order to afford my private education, even with the help of scholarships. Working part time while in school allows me to afford a nice apartment and my living expenses. If I didn’t work, I wouldn’t eat! 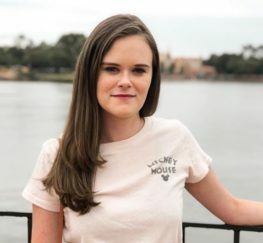 I’ve held several jobs in my time in undergrad, so read on for my tips! 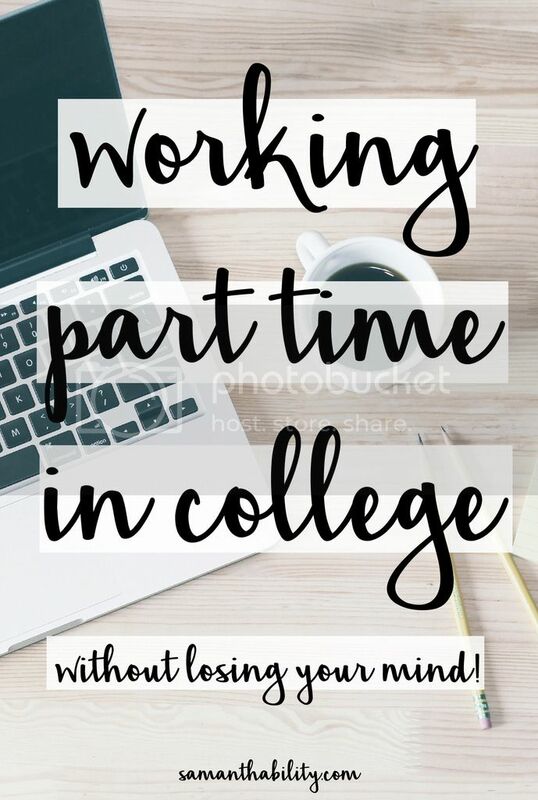 If you are struggling academically or with time management, then working part time during college is probably not for you. Wait until you’re out of school or only work on breaks/vacations. Working is a big time commitment and you will have to master time management in order to find enough time to get all your school work done. 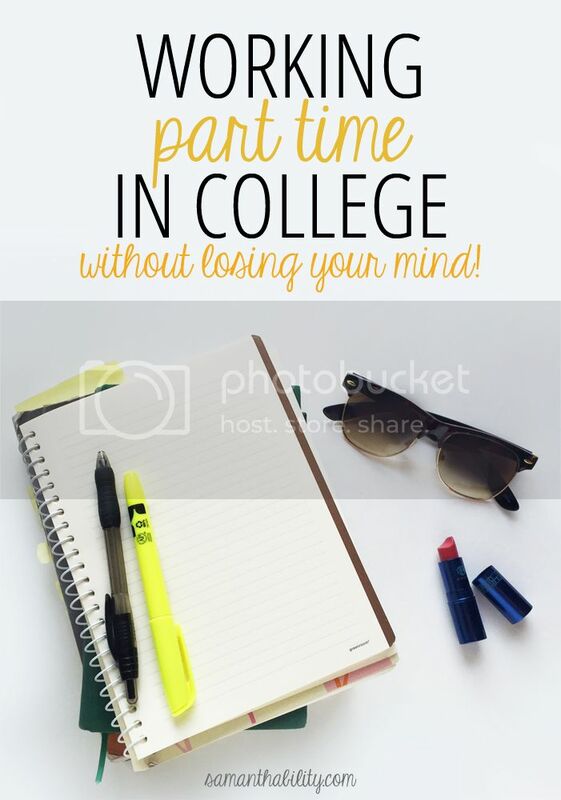 If you know you are going to work part time while in college, try to plan your class schedule around having a part time job. This might mean different things for different people. In the case of my first retail job while in college, the shifts were 8 hours long from 10 am until 6 pm, which would take the entire class day. Thus, I had a Monday/Wednesday/Friday schedule, meaning I had no classed on Tuesday’s and Thursdays. This is my go to. (Pro tip: aim for only Tuesday/Thursday classes and it will be the best thing you’ve ever done.) Schedule your classes in large clusters back to back, rather than spread out throughout the day with gaps in between. If you only have morning classes, that frees up the afternoon and evening for part time work. Consider these things when creating your schedule, and be upfront with your employer about when you will be available. I’ve never personally worked on campus, but a lot of my friends have and it seems like a great gig. On campus jobs often are limited in pay and hours but you gain solid work experience and you can’t beat the location. Sometimes on campus jobs function as work study which goes towards tuition, but other times there is hourly work available, particularly in admissions, financial aid offices, and with dining services. Weekends and seasonal times are always a great time for working, if you don’t mind losing the free time. It can be hard to work through your college break, especially when all your friends are relaxing and having fun. However, the extra cash will be worth it in the long run! This may seem like a challenge for college students, but get creative with it! I don’t mean that if you are studying pre-law to go apply to a law firm. I mean think outside the box. What can you do NOW to get closer to your career goals? For example, I want to be a writer (meaning, I want to get paid to write). I search job boards for paid writing opportunities, and I’ve actually been successful in this endeavor. Don’t think just because you lack practical experience that you can’t start working towards your career. Make your own experience. Studying business? Start your own side hustle. Studying foreign language? Tutor or offer services as a translator. Studying physical therapy? Volunteer or search for a paid internship with your schools coaches/nurse. Think broad and be ruthless in your search for experience. It can be so exhausting to balance work and school. If you ever slack behind in your classes or if you just feel yourself losing your sanity, it might be time to reevaluation. Talk to your employer about what’s going on, and how you might need to cut back hours to focus on an upcoming exam. The best balance for me is between 17-25 hours of work a week. Start slow and build from there, and don’t be afraid to change your mind. Working while in school gives you so much more financial freedom! How do you balance work and school?